While Malaysian quarter-litre motorcycle riders are still waiting for the 2019 Honda CBR250RR, neighbours Thailand has had their wait ended with the launch of Honda’s 250 cc sports bike. 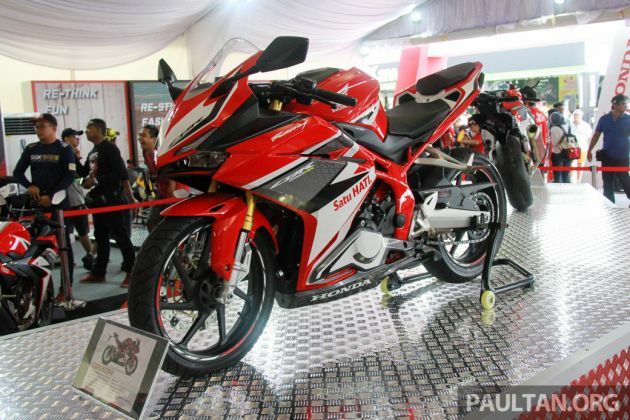 What is not so nice is the price – 249,000 Thai baht (RM32,000), which places the CBR250RR amongst 400 cc competition. The reason for the premium pricing is because Thailand’s CBR250RR is sourced directly from Japan, compared to it being obtained from Indonesia. This makes the CBR250RR more expensive than the single-cylinder 286 cc Honda CBR300, which is also sold in the Thailand market. Perusing the specifications sheet, there is not a lot of difference between the Japan import and the Indonesia model. The only difference is the LED turn signals are separated from the daytime running lights and located on stalks on either side of the front cowl. Powered by a DOHC parallel-twin displacing 249 cc and fed by EFI, the CBR250RR produces 38.7 PS at 12,500 rpm and 23.3 Nm of torque at 11,000 rpm. With power getting to the ground via a six-speed gearbox and chain final drive, the CBR250RR use ride-by-wire, with three ride modes – Comfort, Sport and Sport+. Upside-down forks are standard on the CBR250RR, along with a rear monoshock and Honda’s Pro-Link suspension, aluminium swingarm, LCD instrument panel and LED lighting all round. Single-disc brakes with ABS front and rear do the stopping and fuel is carried in a 14.5 litre tank. The post 2019 Honda CBR250RR now in Thailand at RM32,000 appeared first on Paul Tan's Automotive News. 0 Response to "2019 Honda CBR250RR now in Thailand at RM32,000"